Are your clothes taking too long to dry and does the air flow through the exhaust hose seem too slow. These are usually signs that maintenance is required on your dryer. Most exhaust systems on modern dryers are flexible hoses that tend to bend and flex in many locations. Dryers are usually pushed back against the exhaust hose which constricts the hose causing it to be compressed or kinked. When there are bends and restrictions in the exhaust hose lint tends to gather at these points. Lint accumulations and restricted air flow create a situation very conducive to structural fires. Restricted air flow will also cause the exhaust system to overheat and the high temperature limit switch will cycle on and off excessively, shortening the life of the switch. Lint should of course be removed from the lint screen each time you use your dryer. Other locations to check on a regular basis are the exhaust hose on the back of the dryer, both where it hooks to the dryer and to the wall, and the exterior vent cover to ensure there is no build up or other obstruction at that location. We recommend regular checks and maintenance be performed every six months. This not only helps protect from a structural fire but will also enable your dryer to operate more efficiently. 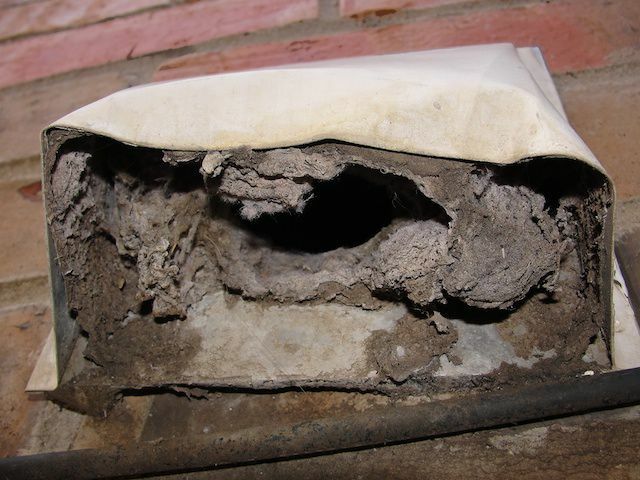 If your dryer vent looks like the one below, its time for some maintenance!